Simply fill in this online form and receive a FREE cookie! 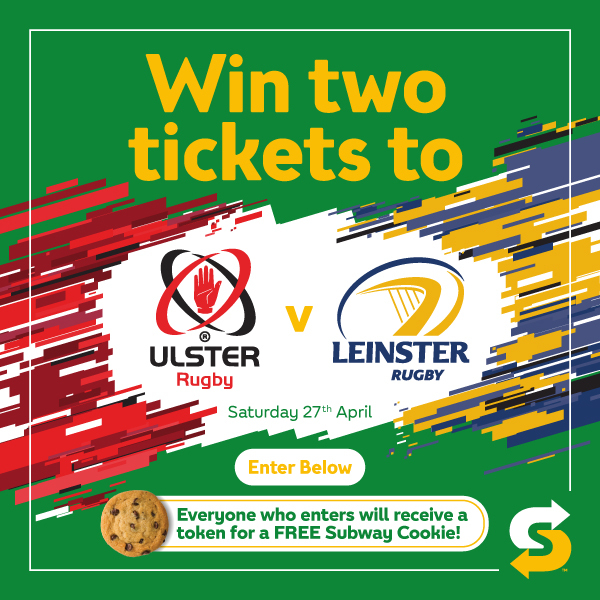 To be in with a chance of winning 2 tickets to Ulster V Leinster on Saturday 27th April at the Kingspan Stadium, simply tell us a little about your last Subway visit by completing the form below. Everyone who enters will receive a token via email for a FREE subway cookie. The winner will be notified on Friday 26th April at 9:30am. Good Luck! When you last visited Subway who did you visit with? When ordering, do you like to choose from the menu or build your own from scratch? Do you usually eat-in or take away when you visit Subway? In the last month, which of these did you visit? Tick all that apply.. . Were you asked if you'd like to use it today? Please note: You must select the slider above to receive emails for us to contact the winner.